This model is edge lit and the LED tester indicated one side had open LEDs in the strip. 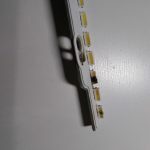 There are a few versions of replacement LED strips but this model used the two pin connector version. There is a youtube video for a similar model here. The small screws holding the rear cover and bezel strip very easily and I ended up stripping quite a few despite being careful. I had to drill them out. There is some double sided tape on the edges holding the panel down which must be carefully be removed to separate the lcd panel from the frame. The diffusion sheets are placed above the inner bezel and only held down by a bit of tape at the tabs. Testing the bad strip found multiple open and shorted LEDs on the one side. The other side was fine but I had ordered a full left and right set. After replacing the strips and putting the TV back together, I noticed some of that double sided tape had slipped into the visible area of the screen. There was also a small area of the panel near the edge that had some damage. Taking the panel apart to move the tape, the damaged area had spread into a large crack when I lifted the panel. I did notice I wasn’t careful enough making sure the panel and diffusion sheets were sitting squarely and flush on the bezel. Pressing down on the metal bezel might have caused the initial damage to the panel.